Where mobility for humankind is concerned, however, almost all types of transportation are still highly dependent on fossil fuels because gasoline- and diesel-powered vehicles are predominant throughout the world. Even if various countries develop and use alternative energy generation systems, they cannot survive without petroleum-derived fuels, which power transport. In view of the expected increase in global energy needs and of environmental concerns, we need to make rapid progress in energy efficiency and further develop a broad range of clean alternative energy sources to reduce emissions and solve climate change problems. The most important transport problems are often related to urban areas and take place when transport systems, for a variety of reasons, cannot satisfy the numerous requirements of urban mobility. Urban productivity is highly dependent on the efficiency of its transport system to move labor, consumers and freight between multiple origins and destinations. skyTran uses state-of-the-art maglev propulsion, the most energy-efficient way to travel by mass-transit. 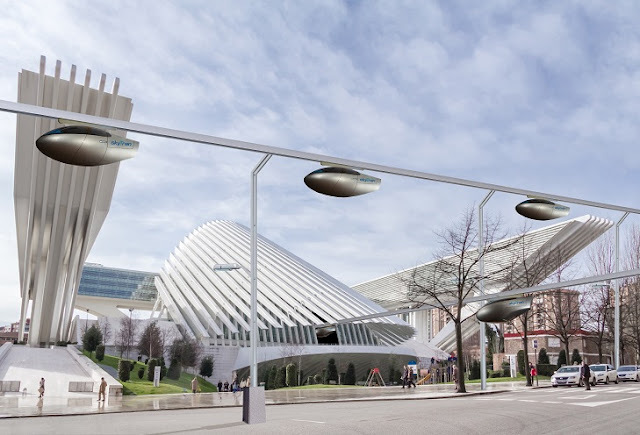 The kinetic energy-driven skyTran system emits virtually no pollution and it doesn’t need much energy to operate. The legacy of polluting combustible engines can be reduced significantly by installing a clean and green skyTran system. Israeli city of Herzliya will be the first to run an in-city skyTran. The Herzliya municipality is collaborating with global company skyTran to plan the construction of an aerial cable car that will connect the train station to the city’s beachside marina. This project was originally developed by NASA to help improve the city’s public transportation within a few years, and perhaps ease every day traffic, as reported by Geektime. The sophisticated skyTran computer network paces vehicles at optimum spacing and speeds to handle a significant number of commuters in a safe and efficient manner. The skyTran system recognizes you, responds to where you would like to go, and gets you there in the fastest time possible. The minimal power that is needed to operate the skyTran maglev vehicles can be obtained almost entirely from clean energy such as solar power. The poles, tracks, and even the vehicles provide an ideal platform to hold solar panels. One of the latest designs by skyTran uses small, two-person cars or pods suspended below a small, elevated track. Two people only to keep the weight down and the track size small. The most cars on the road only have one or two people in them, so that makes sense. The pods move well above the road traffic, so they are not slowed down by intersections and other traffic. With their magnetic suspension, they are very efficient and can travel about 200km/h. Pods move down to ground level at stations so they are easy to access without stairs. Wheelchair versions are available, along with empty pods for bikes or bulky parcels. To move off, you merely tell the pod your destination. It moves up a ramp to the main rail, joins it and you are automatically guided to your destination – no stops, no interchanges. At your destination, the pod moves onto an off-track and drops down a ramp to your stop. Since you are off the main track, all other pods can pass without needing to slow or stop. Your pod is now ready for the next passengers. Should there be a peak demand elsewhere on the system; empty pods can automatically go to where they are needed.